Diputación de Huesca, a Spanish regional government, has called for offers to redesign its website. Once again, when it comes to public services in Spain, the process is full of shenanigans and countless inconsistencies, rising a solid suspicion that it would not be a fair selection process. Is that a problem? Well, it is since they play with my money. Diputacións are one of the levels of local administration in Spain. Their main purpose is to provide services to the smallest councils, as they are so small that hardly can provide those services by themselves. However, diputacións are driven and controlled by the strongest council authorities, with more representation and political weight. Eventually, Diputacións became a second, darker, dodgier way to get funding for the main council authorities, while small councils struggle to provide the very basic services to citizens, as usual. Why Diputacións don’t just disappear, then? Truth is almost everyone in Spain seems happy with a dodgy way to manage funds, provided that soon or later everyone will taste a pie’s share. 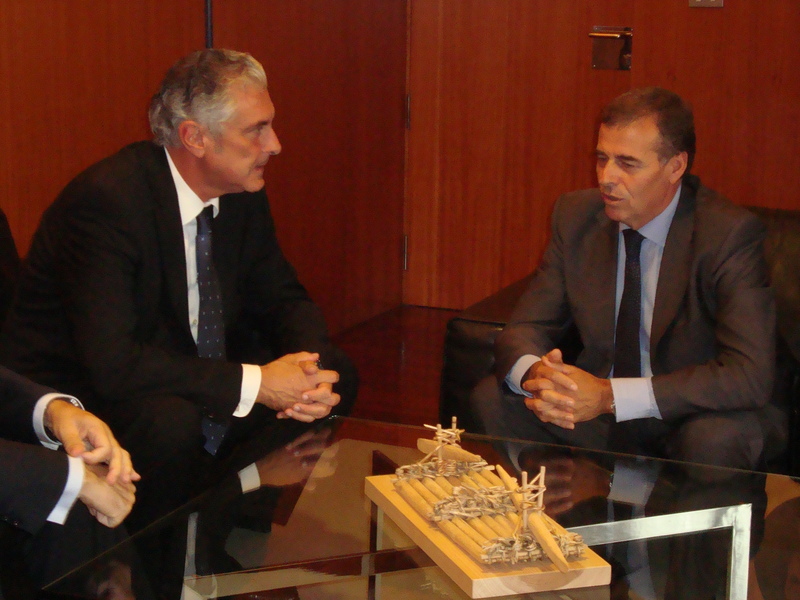 On the right, Antonio Cosculluela (left-of-the-center PSOE), president of Diputación de Huesca. If you want to know more about his way to manage public money, you can read more by clicking on the picture. The deadline to tender is 5th April, the shortest deadline possible to be legal. It looks like that website’s redesign must be an urgent job. Unfortunately, Holy Week happens to be these days, resulting in a deadline of just 8 working days. Don’t you have time in 8 days to know about the offer, to study it, to gather all the documentation and to produce an offer good enough to win that contract? I bet you have! Or perhaps you wouldn’t. The documentation attached to this call to offering is a 56 pages’ thick, dense collection of rules and administrative jargon. How many permits you have to gather, what the legal deadlines are for every submission, what the penalties are if there is a break in the contract ’s agreement, etc… However, only 1 page in 56 actually describes, quite vaguely, what you have to do if you get the contract (page 41). Then, let’s talk turkey about that important page. What does the Diputación of Huesca’s website need? A redesign or so they say. An analysis of website’s proposal architecture, a redistribution of contents, and a full design for every page on the website. Is programming included? Well, no, apparently other people will deal with software. Brilliant, sure you can do this job in four months… even in a quarter. Hum, no so fast. The call to offering says that you need to perform this work of redesign during 22 months. That’s what is called a continuous redesign. According to this, you will earn almost €80,000 for the first 10 months, €27,000 for the following 12 months, and another €27,000 for twelve more months. I have to admit that we haven’t talked yet about working for three years, but apparently you will earn some money in a third year, while your job responsibilities ended up to one year earlier. In other words, either they are delaying the payment for one year, or they trust you so much that they expect that this continuous redesign contract will be renewed. I would add that €27,000 per year sounds like a one-person one-year salary to me, but I wouldn’t like, without any proof, to rise suspicions of contracting a company just to pay for your employee . Ok then, €110,000, eight days to tender… you may need a great team. Not necessarily. You only need a guy from Huesca, plus a designer, plus a specialist in marketing online. Oh, marketing online! Why do they need a specialist in marketing online to carry on a website’s redesign? Yet it’s even worse the position for the local guy. You need to keep a monthly face-to-face meeting with someone in Diputación, for the full extension of the contract, whatever it is. Not that cheap if you are not from Huesca or really close by. When it comes to assess which one is the best offer, points will be allocated following common rules. Pretty interesting is the section “improvements”, though. You could receive up to 10 points in 100 if you offer more services than those already required. As you have little information about what you may do, they want to help you with this: they will appreciate if you can provide films or images of Huesca to be used in the website. In 8 days sure you can do something about it. After knowing this there are enough clues in the call to offering to come up with an educated guess. I would say that the company awarded with that contract will be a local media company, with a good collection of Explore Huesca films, already working in the house, probably already working on the current website’s maintenance, with one employee who has done a couple of courses on marketing online, and, of course, knowing from many weeks ago that there would be a tendering process. But unfortunately it is only a guess.